This book is based on the classic ‘Holland & Brews Manual of Obstetrics’. 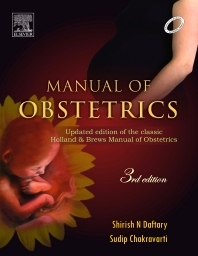 It presents a thorough and comprehensive exposition of obstetrics for undergraduate students. Basic principles, investigations, management options as well as the recent advances have all been explained in a simple and systematic manner. A practical approach is adopted throughout the book and problems likely to occur in day-to-day clinical practice are highlighted. Dr Sudip Chakravarti is currently working as Professor of Obstetrics & Gynaecology, Vivekananda Institute of Medical Sciences, University of Kolkata. He is the former President of Bengal Obstetric and Gynaecological society and Vice President of Federation of Obstetric and Gynaecological Societies of India (FOGSI).